STAR WITNESS (AUS) (2007). 4 wins-3 at 2-to 1200m, VRC Coolmore Stud S., Gr.1. Sire of 369 rnrs, 226 wnrs, 14 SW, inc. Global Glamour (ATC Flight S., Gr.1), Star Turn, Mella Maria, Fuhryk, Graff, Crown Witness, Our Crown Mistress, Stellar Collision, Lord Balmoral, Lycurgus, Magic Alibi, Pearl Star, The Barrister - High Volatility (H.K. ), Well Sprung, SP Kimberley Star, Serenade, Terminology, Berkshire Lady, She's Our Star, Shesees Everything, etc. Musical Query (f. by Star Witness). 6 wins. See below. Starletto (f. by Star Witness). Placed at 3 in 2018-19 in Aust. Belgietto (Bel Esprit). 7 wins from 1000m to 1650m, A$272,101, VRC Skipton H., National Patient Transport H., Bendigo JC TROA H., 2d VRC Grazia Ultimate Style Guide H., Big 6 H., SAJC Moet & Chandon H., Sportingbet H., MRC Manhattan Rain at Arrowfield Stud H., 3d SAJC CS Hayes Memorial Cup, L, MRC 7 Eleven Cath White Memorial H., SAJC SAROA H., Tattsbet H., William Hill H., MRC Charge Forward at Arrowfield Stud H., Betfair H.
Radio Song (Unbridled's Song). 5 wins to 1250m, A$133,380, STC Ranvet H., Australian Hotels Association NSW H., Schweppes H., 2d AJC Wenona Girl H., L, Alleged H., 3d AJC ES Playfair H., STC Angostura Bitters H., Canberra RC Southern Cross Ten H., 4th AJC Sapphire S., Gr.2. Producer. Churning (Lonhro). 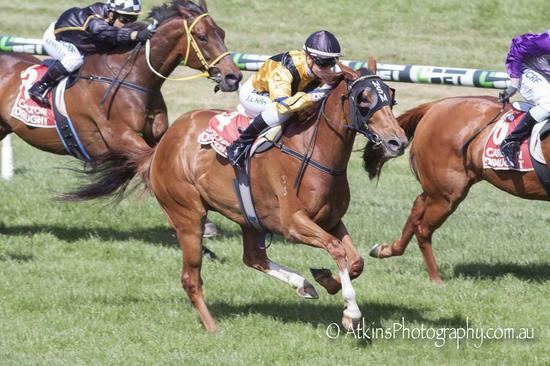 Winner at 1000m in 2018-19, 3d BRC Mode S., L, ATC Tab.com.au 2YO Fillies' P., 4th BRC Gold Edition P., L.
Pickabee (Jet Spur). 5 wins to 1350m, A$150,980, BRC Kirks H., Mount Franklin Sparkling H., Racing Retro P., Carlton Mid H., 2d BRC Grinders Coffee H., 3d BRC Juanmo S., L.
Prince of Passion (Castledale). 5 wins at 1200m, 1400m, NZ$141,370, ARC New Zealand Herald H., Twilight Cup, Counties RC Fastrack Insurance H., 2d WRC Thorndon Mile, Gr.1, ARC Celebrating Rangipo H., 3d ARC Woodpecker Hill H., Counties RC NRM H.
Marmi (Lion Heart). 2 wins at 1350m, 1400m, Matamata RC Colchester Engineering H., 3d CJC Inglewood S., L, ARC Ray White H.
Royal Captive (Royal Academy). 5 wins from 1950m to 2600m, R482,655, Clairwood Unicorn Tyres & Tubes H., 2d Turffontein Racing Association H., Gr.3, 3d Greyville Gold Vase, Gr.2, Turffontein Nijinsky Derby Trial, L.
ADAGIETTO (Sackford). 2 wins. See above. PACKING WINNER (Zabeel). 7 wins from 1600m to 2400m, HK$16,538,750, HKJC Citi Champions & Chater Cup, L, Mission Hills Sha Tin Trophy, L, 2d HKJC Cathay Pacific Jockey Club Cup, Gr.2, Cathay Pacific International Cup Trial, L, 3d Cathay Pacific Hong Kong Cup, Gr.1. Simplyirresistible (Royal Academy). 6 wins from 1100m to 1600m, A$188,569, WATC Perth Plasterboard H., D'Orsogna Brothers H., 2d WATC Westspeed 3YO H., 3d WATC La Trice Classic, L. Producer. Carnero (Carnegie). 3 wins-2 at 2-from 1200m to 1600m, A$532,450, MVRC Spotless H., 2d VRC Sires' Produce S., Gr.2, MVRC JRA Cup, Gr.3, 3d MVRC Bill Stutt S., Gr.2. Gratis (Orpen). 2 wins at 1200m, 1600m, A$88,940, MVRC Skycity Adelaide Cup March H., 2d MVRC Bookiesonline.com.au H., 3d SAJC Auraria S., Gr.3, VRC Highpoint H. Producer. Embark (Choisir). 4 wins at 1200m, 1300m, A$270,555, ATC Sally Large H., Pacific West H., Schweppes H., 3d SAJC Proud Miss S., L. Producer. NICCANOVA (Nicconi). 7 wins from 1000m to 1600m, A$430,100, to 2018-19, BRC Fred Best Classic, Gr.3, Qld Tatt's RC Recognition S., L, BRC Thyme2 Restaurant Sofitel H., Hamilton Hotel H., Peter & Kerry H., 3d BRC Queensland Guineas, Gr.2. PLOVERSET (Street Boss). Winner at 2, A$136,800, VRC Football S., L, 2d VRC Hoppegarten Racing Trophy, 3d VRC Thoroughbred Breeders S., Gr.3, MRC Quezette S., Gr.3. 6 wins to 1000m, A$116,880, to 2018-19, SAJC Plumbing & Pipeline Solutions H., 2d SAJC James Boag's H., 3d SAJC Medallion Homes H.